This page List of artistic media is part of the medium specificity series. 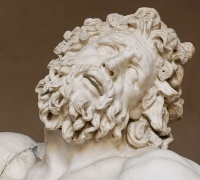 Illustration: Laocoön and His Sons ("Clamores horrendos" detail), photo by Marie-Lan Nguyen. In the arts, a medium (mediums, media) is a material used by an artist to create a work. In drawing, "media" refers to both the material that is manually applied and to the base onto which it is applied. The media applied can be many things but the method of application is a stick type object with a point (not a brush) that transfers particles of media to the base. The point of the stick can be minute as it can be large. The medium applied can be graphite, fusain, pastel, ink among other things . Bases can be paper, plaster, canvas, wood or basically anything that accepts the medium applied from the point of the stick. In cinematography, a sequence of still images is captured with a video camera. A series of individual images are called frames. When these images are shown in rapid succession, a viewer gains the displayed illusion that motion is occurring. In painting, "media" refers to both the type of paint used and the base (or ground) to which it is applied. A paint's medium refers to what carries a paint's pigments, and is also called a "vehicle" or a "base". A painter can mix a medium with solvents, pigments, and other substances in order to make paint and control consistency. In sculpting solid and textured surfaces and structures are shaped or combined using substances and components to form a three dimensional object. Unless indicated otherwise, the text in this article is either based on Wikipedia article "List of artistic media" or another language Wikipedia page thereof used under the terms of the GNU Free Documentation License; or on original research by Jahsonic and friends. See Art and Popular Culture's copyright notice. This page was last modified 18:12, 7 March 2013. This page has been accessed 6,409 times.